Don't know how much space you need? No problem. Our handy Seating Allowance Guide will give you the data you need to calculate the size of space you need for your event. You create a spacious, relaxed atmosphere for dining, dancing and entertaining unequaled in a conventional setting. 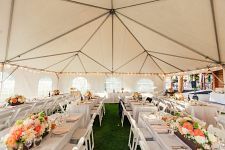 You design and coordinate the tent and accessories to compliment your event and theme. Formal or casual, you control the environment of your event. Your event sparkles and the impact is remembered long after your tent event. Planning a wedding or any other kind of event is easier if you have a timeline. Lucky for you we have one prepared! Each event is unique so please use this countdown as a rough guide only.